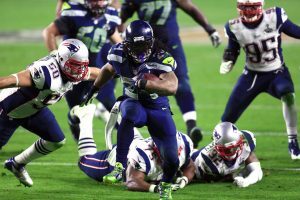 Sunday Night Football for week 10 will be a rematch of Super Bowl XLIX where the New England Patriots defeated the Seattle Seahawks 28-24 to become the undisputed champions. The Patriots lead the AFC East with a record of 7-1 while the Seahawks lead the NFC West with a record of 5-2-1. This game is poised to be the game to watch in week 10 of the NFL, as the Patriots will look to solidify their supremacy and the Seahawks are looking to send a message to the league indicating that they are still in it to win. The Seattle Seahawks are one of the top contenders in the NFC this season, though, they will need to battle it out with the Dallas Cowboys who are on a hot run right now and a steady Falcon’s team who is pushing their way through the season. Seattle’s defense is still one of the best in the NFL currently ranked 10th against the pass, which means the Brady and the rest of the offense will have their hands full in this game especially against the Seattle’s secondary. Offensively they have all the key components to make big plays when needed, but it won’t be easy against New England’s defense. There is no question right now that Tom Brady and the Patriots are the best team in the AFC and possibly the league. Their path is not entirely clear as they will need to contend with teams like the Oakland Raiders and the defending champions Denver Broncos, but they should have no problems reaching the post season. Seattle is coming from a win against the Buffalo Bills on Monday, and are now traveling to Gillette Stadium to play against a well-rested Patriots who are coming off their bye week after winning 4 games in row. This will only serve to complicate things for the Seattle Seahawks, who once again will be without defensive end Michael Bennett. In the last two games without Bennett their defense has dropped given 50 points, an unheard of 58 first downs and 800 yards; if they hope for any chance to beat the Patriots they need to figure a much better game plan than the one they have been using in the past two contents. In these last 4 consecutive wins, the New England Patriots have won by an average of 16.5 points; now the Seahawks have not lost a game by more than 8 points since week 2 of last season, but, with a weakened defense they might just get blown out of the water in this game. The current NFL line at Ace Sportsbook is Patriots laying 7.5 and a total of 49. At first glance this may seem like a lot of points but like I mentioned Seattle’s defense is suffering without Michael Bennett and Brady’s game is on fire. This game will have the same result than Super Bowl XLIX, except this time it won’t be a close game, not by a long shot. Pats against the spread and over 49.